Each section of this course satisfies the Florida one hour requirement in administration/supervision. Section B also meets the two hour prevention of medical errors requirement. For those certified by ASCP, Section A provides 10 contact hours in laboratory management. Section B provides 8 hours in laboratory management and two hours in patient safety. If you’d like to learn more about Lean methods, this is a great place to start. 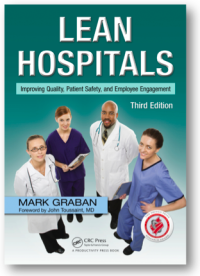 Lean Hospitals, Third Edition explains how to use the Lean methodology and mindsets to improve safety, quality, access and morale while reducing costs, increasing capacity, and strengthening the long-term bottom line. This updated, expanded edition explains how Lean practices can help reduce frustrations for caregivers, prevent delays and harm for patients, and improve the long-term health of your organization. This edition includes new sections on structured Lean problem-solving methods (including Toyota kata), Lean Design, and other topics used by leading edge health systems. Additional examples, case studies, and explanations are also included throughout the book. Please note: Section B meets the Florida 2 hour prevention of medical errors requirement. For ASCP Section B provides two hours in patient safety.